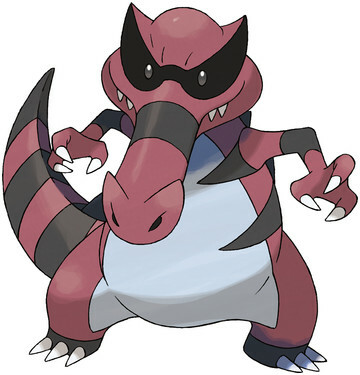 Krookodile is a Ground/Dark type Pokémon introduced in Generation 5. It is known as the Intimidation Pokémon . The effectiveness of each type on Krookodile. In Generation 5, Krookodile has a base Defense of 70. In Generation 5, Krookodile has a base experience yield of 229. Krookodile learns the following moves in Pokémon Ultra Sun & Ultra Moon at the levels specified. Krookodile learns the following moves via breeding in Pokémon Ultra Sun & Ultra Moon. Details and compatible parents can be found on the Krookodile egg moves page. These moves can only be learned in Pokémon Ultra Sun & Ultra Moon by a previous evolution of Krookodile. Check the respective Pokédex for the exact details. Krookodile can only learn these moves in previous generations. It must be taught the moves in the appropriate game and then transferred to Pokémon Ultra Sun & Ultra Moon. Krookodile learns the following moves in Pokémon Sun & Moon at the levels specified. Krookodile learns the following moves via breeding in Pokémon Sun & Moon. Details and compatible parents can be found on the Krookodile egg moves page. These moves can only be learned in Pokémon Sun & Moon by a previous evolution of Krookodile. Check the respective Pokédex for the exact details. Krookodile can only learn these moves in previous generations. It must be taught the moves in the appropriate game and then transferred to Pokémon Sun & Moon. Does the game really say "pissed off" when Anger Point activiates? Why did Earthquake superaffect my Charizard? How do I get a Krookodile?